After the heavy rains, we (myself, Shachi, and M.A.) decided to take a hike down to the falls to see it in full flow. Of course, this was completely forgetting the fifteen river crossings and the one spot where both sides of the canyon are covered in the high water. Many log bridges improved the probability of getting across with our feet dry, but a few still required looking upon rocks even two inches under as a stepping stone. We weren't the only ones with this thought, as the trail was quite crowded. The trail is about two miles from the start at the top to the bottom of the lower falls. Most of the falls cannot be gotten to safely even in dry times as it is surrounded by steep canyon walls and the riverbed itself keeps dropping quite suddenly. 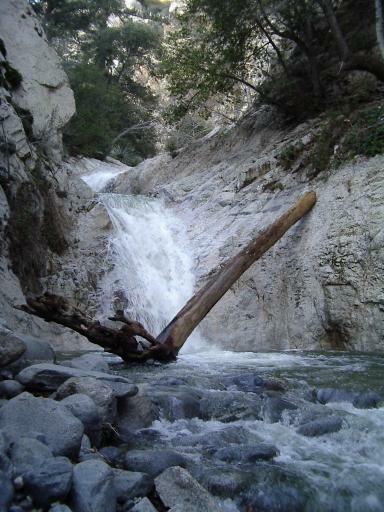 This leaves one only viewing the larger falls from high above, but once back down to the water, a short few tenths of a mile and nearly half of the crossings bring one to the bottom of a somewhat smaller fall. And when we got there, we saw the falls like this.